This article is about deformation in mechanics. For the term's use in engineering, see Deformation (engineering). "Breaking strain" redirects here. For the short story by Arthur C. Clarke, see Breaking Strain. For the novel by Paul Preuss, see Venus Prime. 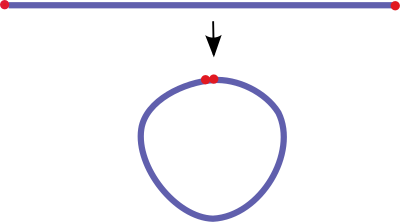 The deformation of a thin straight rod into a closed loop. The length of the rod remains almost unchanged during the deformation, which indicates that the strain is small. In this particular case of bending, displacements associated with rigid translations and rotations of material elements in the rod are much greater than displacements associated with straining. Deformation in continuum mechanics is the transformation of a body from a reference configuration to a current configuration. A configuration is a set containing the positions of all particles of the body. A deformation may be caused by external loads, body forces (such as gravity or electromagnetic forces), or changes in temperature, moisture content, or chemical reactions, etc. Strain is a description of deformation in terms of relative displacement of particles in the body that excludes rigid-body motions. Different equivalent choices may be made for the expression of a strain field depending on whether it is defined with respect to the initial or the final configuration of the body and on whether the metric tensor or its dual is considered. In a continuous body, a deformation field results from a stress field induced by applied forces or is due to changes in the temperature field inside the body. The relation between stresses and induced strains is expressed by constitutive equations, e.g., Hooke's law for linear elastic materials. Deformations which are recovered after the stress field has been removed are called elastic deformations. In this case, the continuum completely recovers its original configuration. On the other hand, irreversible deformations remain even after stresses have been removed. One type of irreversible deformation is plastic deformation, which occurs in material bodies after stresses have attained a certain threshold value known as the elastic limit or yield stress, and are the result of slip, or dislocation mechanisms at the atomic level. Another type of irreversible deformation is viscous deformation, which is the irreversible part of viscoelastic deformation. In the case of elastic deformations, the response function linking strain to the deforming stress is the compliance tensor of the material. Strain is a measure of deformation representing the displacement between particles in the body relative to a reference length. A general deformation of a body can be expressed in the form x = F(X) where X is the reference position of material points in the body. Such a measure does not distinguish between rigid body motions (translations and rotations) and changes in shape (and size) of the body. A deformation has units of length. where I is the identity tensor. Hence strains are dimensionless and are usually expressed as a decimal fraction, a percentage or in parts-per notation. Strains measure how much a given deformation differs locally from a rigid-body deformation. A strain is in general a tensor quantity. Physical insight into strains can be gained by observing that a given strain can be decomposed into normal and shear components. The amount of stretch or compression along material line elements or fibers is the normal strain, and the amount of distortion associated with the sliding of plane layers over each other is the shear strain, within a deforming body. This could be applied by elongation, shortening, or volume changes, or angular distortion. The state of strain at a material point of a continuum body is defined as the totality of all the changes in length of material lines or fibers, the normal strain, which pass through that point and also the totality of all the changes in the angle between pairs of lines initially perpendicular to each other, the shear strain, radiating from this point. However, it is sufficient to know the normal and shear components of strain on a set of three mutually perpendicular directions. If there is an increase in length of the material line, the normal strain is called tensile strain, otherwise, if there is reduction or compression in the length of the material line, it is called compressive strain. Finite strain theory, also called large strain theory, large deformation theory, deals with deformations in which both rotations and strains are arbitrarily large. In this case, the undeformed and deformed configurations of the continuum are significantly different and a clear distinction has to be made between them. This is commonly the case with elastomers, plastically-deforming materials and other fluids and biological soft tissue. Infinitesimal strain theory, also called small strain theory, small deformation theory, small displacement theory, or small displacement-gradient theory where strains and rotations are both small. In this case, the undeformed and deformed configurations of the body can be assumed identical. The infinitesimal strain theory is used in the analysis of deformations of materials exhibiting elastic behavior, such as materials found in mechanical and civil engineering applications, e.g. concrete and steel. Large-displacement or large-rotation theory, which assumes small strains but large rotations and displacements. In each of these theories the strain is then defined differently. The engineering strain is the most common definition applied to materials used in mechanical and structural engineering, which are subjected to very small deformations. On the other hand, for some materials, e.g. elastomers and polymers, subjected to large deformations, the engineering definition of strain is not applicable, e.g. typical engineering strains greater than 1%, thus other more complex definitions of strain are required, such as stretch, logarithmic strain, Green strain, and Almansi strain. where e is the engineering normal strain, L is the original length of the fiber and l is the final length of the fiber. Measures of strain are often expressed in parts per million or microstrains. The true shear strain is defined as the change in the angle (in radians) between two material line elements initially perpendicular to each other in the undeformed or initial configuration. The engineering shear strain is defined as the tangent of that angle, and is equal to the length of deformation at its maximum divided by the perpendicular length in the plane of force application which sometimes makes it easier to calculate. The stretch ratio or extension ratio is a measure of the extensional or normal strain of a differential line element, which can be defined at either the undeformed configuration or the deformed configuration. It is defined as the ratio between the final length l and the initial length L of the material line. This equation implies that the normal strain is zero, so that there is no deformation when the stretch is equal to unity. The stretch ratio is used in the analysis of materials that exhibit large deformations, such as elastomers, which can sustain stretch ratios of 3 or 4 before they fail. On the other hand, traditional engineering materials, such as concrete or steel, fail at much lower stretch ratios. where e is the engineering strain. The logarithmic strain provides the correct measure of the final strain when deformation takes place in a series of increments, taking into account the influence of the strain path. Two-dimensional geometric deformation of an infinitesimal material element. Strains are classified as either normal or shear. A normal strain is perpendicular to the face of an element, and a shear strain is parallel to it. These definitions are consistent with those of normal stress and shear stress. For an isotropic material that obeys Hooke's law, a normal stress will cause a normal strain. Normal strains produce dilations. By interchanging x and y and ux and uy, it can be shown that γxy = γyx. A strain field associated with a displacement is defined, at any point, by the change in length of the tangent vectors representing the speeds of arbitrarily parametrized curves passing through that point. A basic geometric result, due to Fréchet, von Neumann and Jordan, states that, if the lengths of the tangent vectors fulfil the axioms of a norm and the parallelogram law, then the length of a vector is the square root of the value of the quadratic form associated, by the polarization formula, with a positive definite bilinear map called the metric tensor. 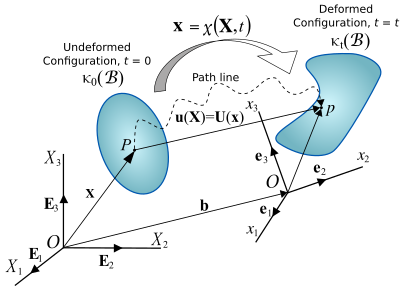 Deformation is the change in the metric properties of a continuous body, meaning that a curve drawn in the initial body placement changes its length when displaced to a curve in the final placement. If none of the curves changes length, it is said that a rigid body displacement occurred. It is convenient to identify a reference configuration or initial geometric state of the continuum body which all subsequent configurations are referenced from. The reference configuration need not be one the body actually will ever occupy. Often, the configuration at t = 0 is considered the reference configuration, κ0(B). The configuration at the current time t is the current configuration. For deformation analysis, the reference configuration is identified as undeformed configuration, and the current configuration as deformed configuration. Additionally, time is not considered when analyzing deformation, thus the sequence of configurations between the undeformed and deformed configurations are of no interest. There are two methods for analysing the deformation of a continuum. One description is made in terms of the material or referential coordinates, called material description or Lagrangian description. A second description is of deformation is made in terms of the spatial coordinates it is called the spatial description or Eulerian description. The material points forming a closed curve at any instant will always form a closed curve at any subsequent time. The material points forming a closed surface at any instant will always form a closed surface at any subsequent time and the matter within the closed surface will always remain within. A deformation is called an affine deformation if it can be described by an affine transformation. Such a transformation is composed of a linear transformation (such as rotation, shear, extension and compression) and a rigid body translation. Affine deformations are also called homogeneous deformations. The above deformation becomes non-affine or inhomogeneous if F = F(X,t) or c = c(X,t). A rigid body motion is a special affine deformation that does not involve any shear, extension or compression. The transformation matrix F is proper orthogonal in order to allow rotations but no reflections. Figure 1. Motion of a continuum body. A change in the configuration of a continuum body results in a displacement. The displacement of a body has two components: a rigid-body displacement and a deformation. A rigid-body displacement consists of a simultaneous translation and rotation of the body without changing its shape or size. Deformation implies the change in shape and/or size of the body from an initial or undeformed configuration κ0(B) to a current or deformed configuration κt(B) (Figure 1). If after a displacement of the continuum there is a relative displacement between particles, a deformation has occurred. On the other hand, if after displacement of the continuum the relative displacement between particles in the current configuration is zero, then there is no deformation and a rigid-body displacement is said to have occurred. The vector joining the positions of a particle P in the undeformed configuration and deformed configuration is called the displacement vector u(X,t) = uiei in the Lagrangian description, or U(x,t) = UJEJ in the Eulerian description. where F is the deformation gradient tensor. Plane deformations are also of interest, particularly in the experimental context. 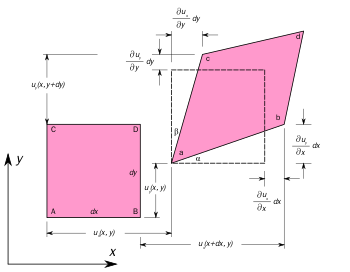 where θ is the angle of rotation and λ1, λ2 are the principal stretches. A simple shear deformation is defined as an isochoric plane deformation in which there is a set of line elements with a given reference orientation that do not change length and orientation during the deformation. ^ Truesdell, C.; Noll, W. (2004). The non-linear field theories of mechanics (3rd ed.). Springer. p. 48. ^ Wu, H.-C. (2005). Continuum Mechanics and Plasticity. CRC Press. ISBN 1-58488-363-4. ^ Lubliner, Jacob (2008). Plasticity Theory (PDF) (Revised ed.). Dover Publications. ISBN 0-486-46290-0. Archived from the original (PDF) on 2010-03-31. ^ a b Rees, David (2006). Basic Engineering Plasticity: An Introduction with Engineering and Manufacturing Applications. Butterworth-Heinemann. ISBN 0-7506-8025-3. Archived from the original on 2017-12-22. ^ "Earth. "Encyclopædia Britannica from Encyclopædia Britannica 2006 Ultimate Reference Suite DVD ..
^ Hencky, H. (1928). "Über die Form des Elastizitätsgesetzes bei ideal elastischen Stoffen". Zeitschrift für technische Physik. 9: 215–220. ^ a b c Ogden, R. W. (1984). Non-linear Elastic Deformations. Dover. Bazant, Zdenek P.; Cedolin, Luigi (2010). Three-Dimensional Continuum Instabilities and Effects of Finite Strain Tensor, chapter 11 in "Stability of Structures", 3rd ed. Singapore, New Jersey, London: World Scientific Publishing. ISBN 9814317039. Dill, Ellis Harold (2006). Continuum Mechanics: Elasticity, Plasticity, Viscoelasticity. Germany: CRC Press. ISBN 0-8493-9779-0. Hutter, Kolumban; Jöhnk, Klaus (2004). Continuum Methods of Physical Modeling. Germany: Springer. ISBN 3-540-20619-1. Jirasek, M; Bazant, Z.P. (2002). Inelastic Analysis of Structures. London and New York: J. Wiley & Sons. ISBN 0471987166. Lubarda, Vlado A. (2001). Elastoplasticity Theory. CRC Press. ISBN 0-8493-1138-1. Mase, George E. (1970). Continuum Mechanics. McGraw-Hill Professional. ISBN 0-07-040663-4. Mase, G. Thomas; Mase, George E. (1999). Continuum Mechanics for Engineers (2nd ed.). CRC Press. ISBN 0-8493-1855-6. Nemat-Nasser, Sia (2006). Plasticity: A Treatise on Finite Deformation of Heterogeneous Inelastic Materials. Cambridge: Cambridge University Press. ISBN 0-521-83979-3. Prager, William (1961). Introduction to Mechanics of Continua. Boston: Ginn and Co. ISBN 0486438090. This page was last edited on 24 January 2019, at 10:14 (UTC).